There are piles of fava beans at the market beginning sometime in June all the way through the summer. They look so invitingly green and healthy. I've seen them for years and never taken them home - what would I do with them? Isn't there a lot of shelling and peeling involved? Yes, there is, but I've since learned that it's totally worth it. I only wish I had written this a few weeks ago when the beans were still young enough that you could eat them raw. You'll have to wait until next year for that. 1) Get the beans out of the pod. This is more fun if someone helps you. I would pair this activity with a nice Crémant du Jura, or maybe a crisp glass of Chablis. 2) Remove the outer skin from each fava bean. I'm not going to dance around the truth here pal - this is a total pain in the @$$. The bean skins are edible, and for soup I wouldn't bother with this step. But for purée, there's no way around it. It's quite satisfying to see the incredibly green shiny beans pile up in your bowl. If that sight alone doesn't work for you then remember what Principal Skinner once recommended for getting through a similarly mind numbing task: "See how many you can do in 10 minutes and then try to break that record." A pairing for this activity? I recommend something simple, yet restorative. Maybe open one of those 2002 Bourgognes you've been saving? 3) Cook the skinned beans until they are easy to mush. You can cook the beans in olive oil and other seasonings, but that doesn't make sense to me, as good olive oil doesn't like to be heated up. I simply cook the beans in canola oil and a little salt, and add good olive oil to the purée. This is quick - somewhere between 5-10 minutes. You'll need something pungent while doing this, like a cold New Zealand Sauvignon Blanc. 4) Season the beans with salt. You can add whatever fresh herbs you like here. I think mint or marjoram work perfectly, thyme is good too. A small amount of garlic and/or onion is also good, but cook them with the beans, I wouldn't add them raw. I don't like the way this turns out using a blender and I still don't have a food processor, so I use the same food mill that I used for BrooklynBabyGirl's food. Works like a charm. Combine the purée of beans and herbs with your best extra-virgin olive oil until you get the texture you want. If you can drink wine while doing this, then you're some sort of Hindu deity. You can serve this purée as hors d'oeuvre by spreading a thin layer on crisp bread. After trying several breads, my favorite is a toasted slice of baguette. The flavor of the puree is green and mellow but also nutty and savory. Something bright is good with this hors d'oeuvre, like a squirt of lemon. Even better is pickled red onion. I stumbled on a great wine pairing for this dish: dry Sherry. The nutty saline oxidized flavors of the cold sherry work perfectly with the green-earthy and nutty beans. We recently ate these with a bottle of N.V. Bodegas Hidalgo Manzanilla La Gitana, $10 (500 ml) and people were using their fingernails to scrape their plates, licking the insides of their wine glasses. If you want to try something new and completely delicious, serve this purée with skirt steak. It works, just trust me this one time. The two types of savory really complement each other. Again, something bright and acidic is important here, or else it's savory piled on savory with no lift. I heartily recommend the same pickled red onions. Or, you could bust out your Fleur de sel or other fine sea salt here. A lighter style of red works great with this dish, something snappy. 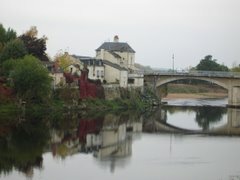 Try a good Beaujolais or a Loire Cheverny. We went with the 2006 Coudert Fleurie Clos de la Roilette, $21, and beautiful music was made that night, friends. Once you make the puree, I'm sure you'll come up with your own interesting ways of serving it. I'm telling you, work your way past the peeling because this stuff is beautiful - it's completely healthy, it's versatile, it's delicious, it gets better with a day or two in the fridge, and you'll be the only one in your group of friends making it. Unless your group includes an Egyptian. At their house you might be served foul medames, a delicious version of this dish made with cumin, tomatoes, and onions. But I have no idea how to make that dish. Corked Wine - Can you Spot it? Do you know what corked wine smells like? If you opened a corked bottle at home or were served one in a restaurant, would you be able to identify it as corked? At this point I have to say that I cannot reliably identify corked wine unless there is an unaffected bottle open for comparison. I bet I'm not alone in this and I mean among you, people who drink a lot of wine. Think about it - when was the last time you opened a corked bottle of wine at home? I open wine almost every day and I never seem to hit a corked bottle. According to the accepted stats, that's impossible. I have to be drinking corked wine from time to time, I'm just not realizing it. Those bottles here and there that I don't like, some of them must be corked. A moment of clarification - overheating cannot cause a wine to become corked. A dry cork that crumbles into the wine does not mean that the wine is corked. Corked wine is wine that contains the compound 2,4,6-trichloroanisole, or TCA, a compound that is introduced by a tainted cork. According to a pretty well accepted Wine Spectator study, about 7% of wines are corked. More white than red, but about 7% on the whole. If you have 100 bottles in your cellar, about 7 of them are corked. That can be both expensive and incredibly frustrating - check out Craig Camp's recent experience with a corked rare wine. The descriptors commonly used to describe corked wine include moldy basement, wet dog, locker room towels, and things like that. I can promise you this - I'm not drinking wine that smells like a sweaty locker room towel. But I must be drinking corked wine from time to time, so what's going on here? TCA can be present in low enough volume so that even a sensitive nose will not get wet dog. Maybe the sensitive nose would notice a lack of fruit, a dull, and muted wine. Or maybe TCA is present in high volume but the taster is not sensitive to it. There are people who can savor great details in aroma and flavor of wine, but who cannot detect TCA when it's present. This is complicated by the fact that TCA can take time to reveal itself in its ugly glory. A wine might seem dull when opened, and then will reek of TCA after 45 minutes. And furthermore, a person drinking corked wine can become sensitized to TCA over the course of the bottle, the way we become sensitized to most objectionable odors if we continue to smell them. My "a-ha moment" with corked wine came at a retail tasting. The clerk opened a bottle of Lambrusco and poured me a taste. I was not impressed with the wine. Not terrible, just dull. The clerk put her nose in the glass and almost retched - "incredibly corked," she said. She opened another bottle and only in comparing them side by side did I understand that the first one was corked. So you'd figure that I would be better at picking out a corked bottle after that, right? That was about two years ago, and I still haven't had a corked bottle at home, if you asked me. At Keith's BBQ the other night I had a similar experience. Keith poured a glass of something and knew immediately that it was corked. I poured myself a glass and again thought it was just dull. 10 minutes later some one else walked over and I poured him a glass and asked his opinion, asking if he thought it was okay. He almost gagged upon smelling. What are these people smelling that i am missing?!? I must be one of those people with very little sensitivity to TCA. TCA can't hurt you, it's not poisonous or anything. The worst that will happen to me is that I'm going to drink a corked wine and think it's bad quality wine, when in reality an untainted version might be great. But I may not go back for seconds, and will walk away thinking that I don't like a certain wine. I may even write about it here, misleading you. Now that I understand my situation, I've become suspicious of basically every bottle I open. "Do you think this is corked" echoes off the walls in my house now. It would be great if wine service professionals in restaurants detected TCA for me, as I clearly cannot do it on my own yet. Jeremy Parzen just wrote something interesting about this. And apparently he's good at detecting cork taint. I guess my point is, if you don't feel confident that you can detect cork taint in a wine, you're not alone. I can't do it, and I have the chutzpah to write a wine blog. NV Arnaud Margaine Champagne Traditionelle Demi-Sec, $34, Terry Theise Selections/Michael Skurnik Wines. How often do you come across a demi-sec Champagne? I have seen literally two on retail shelves (that I can remember), and this is one of them. The Demi-sec designation indicates between 33-50 grams per liter of residual sugar. This is surpassed by only the Doux, or sweet, designation at more than 50 grams per liter. Brut, at under 15 grams per liter is the most common wine we see. Champagne hipsters seem to be gravitating towards Extra Brut (under 6 grams per liter) or Brut Zero / Brut Natural (under 3 grams per liter). As I understand it, Demi-sec Champagnes are not exactly all the rage right now. Maybe this is because people already have the impression that Champagne is too sweet. They're probably drinking insipid Brut wines from enormous houses, wines that are not balanced and seem sweet even at the Brut designation. As has already been pointed out by a certain Champagne writer, the level of residual sugar cannot on its own describe a wine, does not indicate whether or not it will taste sweet or dry. Margaine's estate is located in the 1er Cru village of Villers-Marmery at the eastern edge of the Montagne de Reims. Although Pinot Noir and Meunier are far more common in the Montagne de Reims, this village is about 95% Chardonnay. Margaine's Brut wines are almost all Chardonnay, his Special Club wines are Blanc de Blancs. This demi-sec is 90% Chardonnay. Bright aromas of citrus and yeast, some white chocolate comes though with air time. Well balanced with sweetness and floral flavors, and tense with acidity. Well done in that the wine is sweet but not cloying, and in fact the sweetness is almost in the background. The balance of citrus, chalk, yeast, and white chocolate is the story. I bought another bottle immediately afterwards and drank it again on Friday. Although I liked it, it didn't have the same freshness and tense acidity that I found earlier. Maybe wines with more residual sugar (this particular one has 28 grams per liter and could technically be designated sec) should be consumed shortly after disgorging in order to retain freshness. Maybe my palate has evolved in a year. I really don't know. But the wine was not as fresh as I would have liked, and so the sweetness felt a bit heavy. Ever had a Sec, Demi-sec, or Doux Champagne? Like? No like? I definitely want to try another, but not as dessert. I bet a good Demi-sec would pair beautifully with food...but what food? Theise recommends unagi (Japanese cooked eel with a sweet sauce) or something like Scallops with mango and lemon zest. The more I learn about wine, the more I realize that I don't know. This was also true when I played a lot of chess, when I was getting into economics courses in grad school, basically anytime I've undertaken anything of any import. Even within the wine regions I know, I don't really know anything. I guess it requires some degree of experience and knowledge to understand how much there is that I don't know. For example, it's impossible to understand the vastness of chess until you study the game for a while. Same is true with wine, I would say. Exciting and frustrating at the same time, isn't it? The other night I was lucky enough to go to Keith Levenberg's Wine-fest and BBQ, and I had one of those "I am clueless" experiences with wine. I tasted so many wines that are new to me. There were about 20 people present, most knew each other already, and everyone came with at least two bottles. I had never met any of these folks. They know each other from the E-Bob message boards, NYC wine dinners, and other wine-geek events. Very nice people in general, and lots of interesting wine. And Keith grilled up some delicious food too - lamb meatballs, several kinds of steak, watermelon and feta salad, and minty wheat bulgur salad. I didn't even try to take any notes, so I cannot share the specifics of some of the wines. There was everything from Grand Cru Burgundy to Barolo to Sancerre rosé. Although no Bordeaux, if I am not mistaken. I drank my first Raveneau Chablis, my first Produttori del Barbaresco, and my first Musar. There was a Savennières, a Santaney, a Blagny, and all sorts of other good stuff. And drinking these wines, listening to others talk about them, thinking about them myself...I realized how little I really understand about wine, how limited are my experiences. There was a moment of hopelessness, but then acceptance, and then happiness thinking about all of the learning still to come. Okay, well maybe the happiness was in part due to the distinct lack of any sort of spit bucket. 1992 Edmunds St John Syrah Grand Heritage. Incredibly delicious wine. So pure, so layered, so satisfying. Out of all these amazing wines, who would guess that one of the most memorable would come from...California? 1991 Joseph Phelps Cabernet Sauvignon Eisele Vineyard. Smooth as silk, plush, just delicious. Another excellent California wine. Who knew. Do they still make 'em like this? 1999 Chateau Musar. What an amazing wine! Incredibly acidic, but in a good way. Spicy, fruity, vibrant and alive. The light and translucent color completely belies the wine's intensity. This is the one that I must buy for my own cellar. 2000 François Raveneau Chablis 1er Cru Montée de Tonnerre. Raveneau...I get it now. Crystalline mineral deliciousness, and with such great depth and focus. I want more, but these wines are over $100 a bottle now. M. Levenberg says that there is great Grand Cru Chablis for under $40, so I might stick with whatever that is instead. 2004 Produttori del Barbaresco. Didn't realize that there are about 10 possible wines this could be - sorry, didn't get the specifics. Whatever it was, it was so juicy and delicious, with very nice acidity. And supposedly ages very well too. 2001 Baumard Savennières Clos de Papillon. This is excellent wine, very mineral, some tropical notes to the nose. Well balanced and just delicious. I wound up taking what was left of the bottle home, and it was even better the next day. 2002 Domaine du Closel Savennières Clos de Papillon. Delicious, especially after an hour open. But it clearly will not improve for the next 20 years, something that it is supposed to do. Several tastes commented on the change in style at Closel. Be that as it may, the wine is, utterly beautiful right now. Full of honeyed minerals, nice mellow acids, something herbal running underneath. I should pull the few bottles I have out of the cellar and drink them over the next year or two. 1992 Joh. Jos. Christoffel Erben Ürziger Würzgarten Riesling Auslese **. Pure and lovely with nice orchard fruit flavors, a clean finish that lingers with a bit of spice. I thought it was just great, but my favorite part was watching the experienced Riesling folk in the crowd drink it with this ho-hum reaction. "Good, not great" they said. The Burgundies were not so impressive, on the whole. For example, there was a 1992 Roty Charmes-Chambertin Très Vielle Vignes, and it just didn't move me. A 1995 Blagny was fine but not distinctive. The only one that seemed promising to me was a 1999 Geantet-Pansiot Chambolle Musigny 1er Cru, but even that did not have the same captivating factor as some of the other reds. Maybe mature Burgundy doesn't show as well when surrounded by bigger, more obvious wines. You might be wondering what I brought to this event. I waffled on this. Champagne was my immediate thought, but in the end I went with wine that I assumed would be unique at the tasting, and that might even be new to a few people. 2005 Puzelat Touraine La Tesnière, a lovely smoky and funky white made of Menu Pineau, and the 2004 Puzelat Touraine La Tesnière, a red made of Pineau D'Aunis. I love these wines, but let me tell you - they definitely got a mixed reception from this crowd. Some looked at the label, asked about the grape, talked about buying bottles. Others said "I hate Pineau D'Aunis. It leaves my mouth before it gets halfway down my throat." To each their own, right? "It's Too Hot For Red"
So proclaimed the "server." Quotes for the word "server" because the only thing she shared with a professional server is that she carried the food we ordered from the kitchen to our table. I don't normally trash a restaurant on this blog because we can't afford the time or the money involved to re-visit a place that we don't like. And a critic should go several times before trashing a place. But I'm not a critic, I'm a blogger, so I can say what I want, and you understand that it is what it is. One person's opinion based on, in this case, one visit. BrooklynLady and I went to The Queen's Hideaway on a recent Friday night. I'd heard about this place a few years ago and always meant to try it. Sounds good, doesn't it - whatever Liza Queen buys at the farmers market and feels like cooking, that's what you get. Expect home cooking, like smoked ribs, fried okra, corn bread, things like that. Served up fresh in a (formerly) out-of-the-way spot in Greenpoint...what could be more fun? When I read the feature article on the restaurant in the summer issue of Edible Brooklyn, I knew it was finally time to get over there. When I made our reservation (which took some doing, as no one returned my phone calls) I asked about the corkage policy. "We don't allow it," Queen said. She went on to explain that she puts a lot of care into the wine list and although she used to allow corkage, she doesn't any more. But there are plenty of great wines, she promised. We sat in the garden and looked over the menu. The wine list, though, offered three sparklers (none by the glass), three whites and three rosés. No red wine. The main dish choices were skirt steak or scallops, and since I usually avoid scallops in restaurants, I would eat steak. How could there be no red wine on this carefully selected wine list?!? The group of 6 people at the table near us asked the same question and were told "It's too hot for red" by their server. How do you like them apples. Me: "What is Ham Galantine?" Her: "It's like a hamburger." Me: "You mean it's ground and cooked in a patty?" Her: "It's ham that's been picked at and shaped like a hamburger." Well, that's all we needed to hear to ensure that neither we, nor anyone we love would ever order the Ham Galantine. We laughed - I mean who cares, really. It's a hot but lovely friday night in July and we're out together having dinner in the garden. So what if I'm drinking Leitz Riesling out of a stemless water glass with my steak. The food was fine, nothing great, nothing terrible, just fine. The fried okra appetizer was way too greasy and overloaded with breading. The Dutch pancake topped with cherry tomatoes was good. The steak was nicely seasoned and the best thing on the table was the corn pudding that came on the side. Even at $25, the steak was a satisfying dish. If this were my local joint, I'd be happy to stop in for dinner about once a month, because the food is fine. But this is not a destination spot. And when you take the truly awful service into account...unless my experience was a complete anomaly, I really cannot imagine why anyone would travel to have dinner at this restaurant. Her: "Our credit card machine is broken." Me: "Well, I don't have cash - I called first to ask if I could use a card." Her: "The machine broke recently." Me: "So, should I mail you a check or something?" Her: "There's an ATM at the deli a couple of blocks away." Me: "You know what, why don't you send the owner out here." Her: "I'll go and try it again. Sometimes it charges you twice." Me: "Hopefully this will not be one of those times." Still not sure whether or not I was charged twice. And it still bothers me that I left any tip at all, as opposed to 10%. When I was a waiter in college, a 10% tip meant that I royally screwed up service. Does it still mean that? We left, relieved to be gone, a bit sad at the state of the restaurant game in NYC, happy to be strolling hand in hand through Greenpoint. We had delicious pistachio/cardamom ice-cream cones, by the way. NV Champagne Raymond Boulard Cuvée Petraea XCVII - MMII, $38, Imported by Selected Estates of Europe. Yes, more Raymond Boulard. And why not? The last bottle was so great, the prices are so reasonable, and I actually know where to find the wines - they seem to be quite rare in the States, but Astor Wines has them. Petraea, the name for one type of oak used in wine making, is a wine made using the Solera system. Solera refers to the practice of reserving wine and blending in young wine with each new vintage, over time creating a blend of many vintages. Solera wines can achieve a mature and complex character that might not be found in the same producer's younger wines. And if you happen to like a particular solera wine, you can feel confident buying it over and over again, as the blending of so many vintages effectively ensures consistency in the wine. The Champagne I drank includes wines from 1997-2002, as indicated by the Roman numerals on the label. The website also claims that there are 50 year old wines in this cuvée, something I don't understand, if the solera started in 1997. There is no disgorgement date on the bottle, so I can't tell you anything about that. This wine is mostly red grapes - 60% Pinot Noir, 20% Meunier, and then 20% Chardonnay. I loved this wine - this is one of the prettiest noses I've experienced so far in Champagne. There are chalk and biscuits upon opening, and with a little time, there is an incredibly clear aroma of white flowers, like an elegant lady's perfume. Really compelling, and quite heady. I won't lie to you - the nose had me feeling rather amorous. When's the last time a wine did that to you? The palate is quiet and very graceful, with good acidity and great length. As with the last Boulard wine I drank, this is not a fruit driven wine, but a complex and very mineral wine - there is a floral and mineral fragrance in the mouth long after swallowing. This wine is well worth seeking out, in my opinion. There are no special effects, this is not a summer blockbuster. It is more thoughtful than that, it requires and rewards your attention. And please allow me to remind you that it is currently available for $38 at Astor Wines in Manhattan - an incredibly reasonable price for Champagne of this caliber. I will most certainly be buying more. 2006 Thomas-Labaille Sancerre Cuvée Buster Les Monts Damnés, $32, Louis/Dressner Selections. Sancerre might as well be in another wine region, for all of the attention it gets in our Loire Valley-lovin' house. Pouilly Fumé too. They're both as far away and as different from Savennières, for example, as Champagne is from Beaune. Les Monts Damnés is probably the finest terroir in Sancerre, with well exposed incredibly steep slopes that must be harvested by hand. Cuvée Buster is a title created by the Dressners to indicate a particularly fine cuvée by a certain producer in a certain year. Read the amusing story of the creation of Cuvée Buster here. This wine is incredibly delicate, yet focused and intense, with clean citrus fruit, floral, and mineral aromas and flavors. It has excellent acidity and great length, leaving a lovely perfume in the mouth. So well balanced, so great with food, such a beautiful wine. It will probably age well, but why bother? It's so good right now. 2004 Audrey & Christian Binner Riesling Katzenthal, $18, Jenny & Francois Selections. This is simply excellent wine. Full of orchard fruit and bitter honey, and intensely mineral, this wine calls out for food (hot dogs with kraut and mustard?). Apples, peach pits, herbs, and bitter honey on the nose, very clean and pure. The palate is aglow with minerals, but there is good balance with acids and ripe fruit too. There is a slightly oily texture, which is very pleasant. We enjoyed this wine with grilled fresh ham steak and spring onions. Why don't I drink more wine from the Alsace? Or more Riesling? Because I'm a complete ignoramus on both counts, that's why. 2005 Selbach-Oster Zeltinger Sonnenuhr Riesling Auslese **, $27 (375 ml). Two Rieslings in one month - that might be a record for me. This one came at the end of a great meal, and it was very nice, although not as moving as the Binner Riesling. Silly comparison though, as this is a much sweeter wine. Is it correct to call this a dessert wine? And whassup with the two asterisks after the name of the wine? Who can understand what's really going on with German wine? Not me. The nose was surprising with cinnamon, dried golden raisins, peaches, and pure spring water. Viscous on the palate, but still feels light, even though this is sweet wine. Maybe you're supposed to have this with dessert, but we had it as dessert, and really enjoyed it. N.V. Gaspar Florido Manzanilla de Sanlúcar de Barrameda Manzanilla Pleamar, $12 (375 ml), VOS Selections. You read it too - Eric Asimov recently wrote a compelling article about Sherry, and his tasting panel sampled 25 of them. That same Wednesday I grabbed this bottle, and that very evening, after several hours in the refrigerator, we drank it with hors d'oeuvre of fresh fava bean purée on toast. BrooklynLady didn't like it. "I've tried Sherry, I don't like it," she proclaimed. Too bad for her. I loved it. What a pairing - the fresh greenness of the beans, a bit of garlic, mint, fruity olive oil, sea salt...and this interesting wine. I loved its oxidized personality, the way the power of the flavors contrasted with the lightness of mouth feel. Savory, food friendly, and quite refreshing. Makes me want more Sherry, especially since I can try them for less than $15 a bottle. May I take this opportunity to ask this: does Sherry store well in the fridge, or should it be consumed shortly after opening? BrooklynLady and I saw a great documentary about hot dogs recently. It featured many different hot dog joints in cities all over the country. We witnessed deep fried dogs outside Chicago, dogs with coleslaw in South Carolina, a bustling place selling nice looking chili dogs in Pittsburgh, of course Nathans (which I think is overrated) here in Brooklyn, and many others. The condiments and toppings issue really got me going. I've always been something of a purist - sauerkraut and good mustard, nada mas. But all these different toppings, all of those people talking about how much they love a good dog...this program had both of us in a hot steamy hot dog craze. And I wanted more than simple kraut and mustard - I wanted the works. So the next day we barely even woke up and fed the daughter before I was frying a pack of dogs. Yes, frying. Dogs off the grill are good, but frying is my favorite way to go, just like they do it at the Papaya King of my youth. We decided to throw caution to the wind and invent a new kind of dog, something combining toppings that we wouldn't normally use. Since BrooklynLady needs everything to be blazing hot these days (pregnancy?) we went with pickled Jalepeños, relish (sour, not sweet), hot mustard, ketchup (for a little sweet), and a small amount of crumbled cheddar for the creaminess. Sounds good? It really was. Some potato salad and greens...a pretty darn good summer Sunday brunch. Not for you? I hear that. People get really attached to their hot dog condiments. I used to feel that way about kraut and mustard, but this opened my eyes. Trust me - try something different on your next dog. Next time I'm going with coleslaw and mustard. I may even try this dog my pal Adam has been promoting called the Chihuahua - topped with avacado and sour cream. So the wine? We didn't have any, actually. It was Sunday morning - what kind of degenerate do you think I am? But if I were forced to come up with a pairing: Beaujolais. Either the 2006 Vissoux Beaujolais Vieille Vignes or the 2007 Terres Dorées Beaujolais Cuvée L'Ancien (or Vin de Pays, as it may be). That's also a next time. Hey Friends - This week you're in for a special Friday Night Bubbles treat. First of all, the wine is amazing, and although this vintage is gone, you should be able to find the current release, the 1998. But more importantly, fellow blogger and wine lover David McDuff is the guest-author, and as you'll see, he brings all of his astute charms for this post. In an ideal world, there’d be another case of the wine I’m about to write about sleeping in my cellar. In the real world, I can’t think of a more appropriate occasion on which to have pulled the cork from my last bottle. 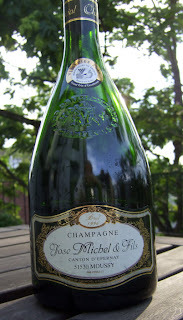 1996 José Michel Spécial Club Brut Champagne. $42 on release. 12% alcohol. Cork. Importer: Wine Traditions, Falls Church, VA. When I headed up for an impromptu trip to New York last week, I threw a few goodies in my wine tote in hopes of sharing them with friends. There was a bottle of something interesting and slightly spirituous (Vieux Pineau des Charentes) for my Scotch loving friend with whom I was staying, an oldish bottle of Mittelrhein Riesling, just in case I ran into Mr. Rockss and Fruit (which I didn’t), and a bottle of grower Champagne, in hopes of a meet-up with Mr. and Mrs. Brooklynguy. That last meeting not only came together but came off like a charm, thanks to an extremely generous invitation to dinner from my host, a guy who happens to be your host every time (almost, that is) you visit this blog. Happily, the wine I’d carted along was showing just as generously. 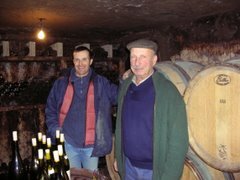 José Michel, whose estate is located in the hamlet of Moussy, just southwest of Epernay, has had his hands in the vigneron business at his family property since 1955. A longtime member of the Club Trésors de Champagne, his vintage “Spécial Club” bottling is essentially, as it should be per the Club’s standards, his top wine, his tête de cuvée. I could go into much more detail about the history of the Club Trésors but you’d be much better off just reading Peter Liem’s excellent post from earlier this year. Zooming into the photo, the embossed detail on the neck of the Spécial Club bottle will reveal that Michel's 1996 comes from a time when the group was still known as the Club de Viticulteurs Champenois. That very bottle, de rigeur for Spécial Club cuvées, would be the only downside to having that ideal case in the cellar. Handsome, yes, but its squat, wide bottomed shape makes for rather awkward storage. Then again, I have thought about expanding my cellar…. But I digress. Though he produces lovely Blanc de Blancs, José (pronounced Zho-say) is best known as one of the true – and few – champions of Pinot Meunier. His current Spécial Club release, 1998, is a 50/50 blend of Meunier and Chardonnay from vines of up to 70 years in age. I seem to remember a similar blend for the ’96, perhaps with a slightly higher proportion of Meunier. It’s also an assemblage of wines vinified in both steel and oak. In any event, Michel’s Champagne has benefited wonderfully from its several years of bottle age, showing a rich yet pale golden color and a nose full of autolytic character. Its aromas were richly infused with toasted brioche, hazelnuts, marzipan and buttered croissants. Generous, sweet and totally focused fruit kicked in on the palate, lush up front but with great acid providing muscle on the mineral-laced finish. Did I detect a little red-fruited spiciness? At this moment in time, there’s a great interplay between the onset of tertiary development and the retention of youthful vibrancy and freshness. Two or three hours after opening, the wine, along with its stream of impossibly tiny bubbles, was still going strong. Its mouthfeel and aromas had become darker and rounder, almost figgy, with an abundance of fruit oils and an unmistakable lacing of beeswax. Beautiful stuff, shared on a beautiful evening in Brooklyn. I know - I just wrote that I might have to change direction, think about wrapping it up here at Brooklynguy, and now only a few days later I write the longest post in the history of blogging. Whaddayagonnado? 4 small - medium yellow or zucchini squash. 1 large green garlic clove. Use any garlic if you can't find green garlic, but any farmer's market has it right now. 4 oz good ricotta cheese. A handful of washed fresh mint leaves. Wash the squash. That rhymes. Dry it, and grate it into a large non-reactive bowl. Grate a layer of squash into the bowl and liberally add salt. Then grate another layer of squash, add more salt, and repeat until you're out of squash. I find that each squash is about a layer. Allow the salted squash to sit for about a half hour. You're salting both to season the dish but also to draw some of the water out of the squash. Meanwhile, bring a large pot of salted water to boil for the pasta. Wash and dry the mint. When a half hour is up, heat some olive oil or butter in a cast iron skillet. Put the spaghetti in the boiling water to cook, al denté is best. Take a handful of the squash and squeeze as much of the water out as you can. Do not wash the salt off the squash. Place it into the skillet and flatten it a bit. Repeat until you've used all the squash. Cook, stirring every now and then, until some parts are browned and the squash is soft and cooked through. Peel the outer layer off the garlic and pound it in the mortar and pestle with a bit of salt. Pound it into a fine paste. Take two ladles of pasta cooking water and put aside in a bowl before you drain the pasta. Drain the pasta, add the cooked squash, the garlic, the ricotta. Finely chop the mint and add it too. Mix this all together, adding pasta cooking water little by little to help blend the ingredients. Taste as you go, stop when you like the texture. So that's the dish. What wine for this dish? I've tried Beaujolais, and it works. But I prefer a white with this. Most recently, a sec-tendre Chenin Blanc with the McDuff - yes, this is that dish, that time prepared with zucchini and marjoram. Then I remembered a comment that Peter of the tasty Cookblog left when I asked how to pair a complex Savennières. He suggested pasta with caramelized onions, walnuts, and orange zest. This is clearly a different dish, but somehow it still seems right. So this time I went with a Savennières, a beautiful dry Chenin Blanc from the master of biodynamics, Nicolas Joly. Joly makes controversial wine. Wines from older vintages get raves, before he went down the biodynamic farming natural wine making road. For more on this, see Peter Liem's discussion of his vertical tasting during a binge weekend in Oregon. Don't miss the comments, by the way. The modern wines, though, seem to divide people, even groups of Loire lovers. This has a lot to do with the incredible bottle variation that plagues Joly, and many other natural wine makers. Joly adds no sulfur at all, so the wines are unstable, and that's it. When you buy them you know you might get a bad bottle. There is another thing about Joly's wines that might annoy people. They supposedly require many days open in a decanter before showing well. I'm going to be honest - that put me off. I'm not sure I can be that accurate about what I will be doing and drinking that far ahead. I read this interesting and amusing set of posts by JD Harden of the new and highly readable blog Rational Denial. He vigorously decanted and tasted over five days. He found that the wine improved over five days, but he never really loved it to begin with. I decided to give Joly another try, and to essentially ignore the five day wait. 2005 Nicolas Joly Savennières Les Clos Sacrés, $27. Mine is not flawed, and it's from the 05 vintage, so it is probably more fruit forward than the 2004 JD discussed on Rational Denial. In fact, I loved this from the moment I opened it, although there was a distinct cheesy phase, kind of unpleasant. Gorgeous and complex nose of minerals, wax, faint baking spice, and an undercurrent of roast nuts. This actually reminds me of good Champagne. Not a fruit-driven nose, more mineral and wax, but absolutely regal and lovely. The fruit comes out on the palate, with pears and other orchard fruit supported by good acidity and more minerals. It's still young and there is plenty of room for relaxation and balance. But you know what - I'm not sure that I would stash this wine away for 20 years, as you might with many Savennières. It's delicious right now and it's already complex, it's not only about fruit. Let's see what happens over the next day or so. Oh - it works perfectly with this pasta dish. Very intense wine, but it supports the flavors of the dish and together they bring out the best in each other. Day 2 - this wine is not showing as well! There are nice aromas of lemon chiffon and orchard fruit, and still amazingly intense minerality, but there is also a lot of alcohol heat on the nose and palate - 14.5% is pretty high I guess. But in this ripe vintage, it'll get there if you vinify the wines all the way dry. It would have been interesting to check in for the next few days, but I just didn't have that kind of patience. It has been such a pleasure to write this blog, mostly because of the community of wine people it has given me access to. Thank you so much for having me! Thank you so much for reading and participating! 300 posts - amazing, really. It's hard to find something meaningful to say, and there is no way that I've said something meaningful in each of 300 posts. A good percentage though, I hope, although some of you may disagree. But you'll politely keep that to yourself, I imagine. So on this occasion I want to share some big news and also some random thoughts for the future of this blog. My news - I am thrilled to tell you that BrooklynLady is pregnant! Our second child is due on December 31st. Surprised that we're having another? Yeah, I do gripe sometimes about the difficulties of being a parent, but my wife and daughter are the central joys in my life. 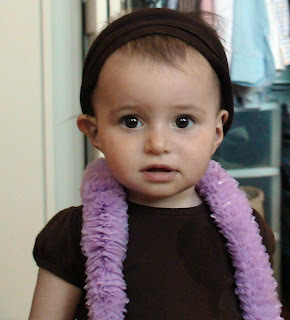 And if you took part in making this amazing little creature (BrooklynBabyGirl at left, now a year and a half old), wouldn't you seriously consider making another one? So that's the big news. There have been many smaller pleasures lately too. Life is so much better for me when I can take pleasure in little things. Like this - the orange lily that looked ridiculously dead all winter just began to bloom. If I remember correctly, it will flower for only a few weeks, but it's a lovely sight every time we step out on the deck. And this - I just enjoyed meeting a fellow blogger (McDuff's torso below and glasses of 1996 Champs, 05 Anjou, and 05 Oregon Pinot) and we had a great time over dinner and a few bottles. And unlike what usually happens when you invite someone you meet on the internet into your home, he didn't hog-tie me and commit all sorts of vulgar atrocities. And this - I've been grilling up a storm, experimenting with hardwoods and herb smoke. Just take a peek at this fresh ham steak - isn't that nice? Some grilled onions and an olive oil/mustard/tarragon sauce...yes, that's the good stuff. So what's in store for Brooklynguy's blog? Well, the recession is hitting me too, folks. I am not in the wine business. With incredibly few exceptions, I pay retail for all of the wine I drink. I have a second kid on the way and must be responsible. That means spending less money on wine. And experimenting less too, for the most part. That means there will be fewer wine review posts here, unless you want to read about Puzelat and my other Loire friends over and over and over. I feel less inclined to describe wines I'm drinking, and more inclined to go deeper, to learn more. To visit regions, to drink and taste everything with local food, to develop a much deeper understanding, and then of course to share that with you. But I have another job and I'm not sure how to accomplish this. There's a piece of me that feels like this might be the natural time to hang up the gloves, so to speak. Instead I will promise not to write unless I have something meaningful to say, but I will write less about the wines I'm drinking - I already wrote about them. So I guess what I'm trying to say is: I'm not really sure what I will be writing about in the next few months. We'll find out together, should you continue to visit. Suggestions are most welcome. It's not the heat, it's the humidity that gets you. I first heard that line in Houston, Texas in the summer of 1994. And it's still true. I don't mind if the thermometer tops 100, as long as it's dry heat. But even a mildly hot day, say 87, can feel unbearable when it's also very humid. It's been hot and very humid in NYC for much of the summer so far. BrooklynLady and I were incredibly excited to get out of the city on a recent weekend, excited to escape the heat but also show the BrooklynBabyGirl to a more rural setting. We went to northwest Connecticut to see her grandparents and then left her with them for Saturday night and went for a little husband and wife time in nearby Sheffield, Massachusetts. Right near Great Barrington. It's gorgeous there - horse farms everywhere, rolling hills, thick forest on the side of the roads. But it was incredibly hot and humid. And there were way more mosquitoes. We still had a blast, and one highlight was the Stagecoach Tavern, the unassuming but delicious restaurant where we ate dinner. Lots of local food featured, including specials of fiddlehead ferns and baby turnips. BrooklynLady's salad was simple and delicious, buttery bibb lettuce and sparky radishes with a subtle lemon dressing. Her braised chicken was excellent and my hangar steak with braised local greens and the aforementioned baby turnips was truly excellent. Without trying to do too much, this was a delicious and satisfying meal, and we loved every minute of it. And get this - the wine list was wonderful. So many wines that I would have loved to enjoy with our dinner, it was hard to select just one. It's as if many of my favorite wines got sick of the heat in NYC and went for a weekend vacation, and happened to stay in this same little town. Friday Night Bubbles is proud to wish you a happy Independence Day, and will appear this week on Thursday in order to afford the proper respect for the holiday. But mostly because I was afraid that you'd be mad if I were to review a French wine on July 4th. NV Raymond Boulard Grand Cru Mailly Brut Nature, $32, Imported by Selected Estates of Europe. I had this wine several months ago and found that the wine got interesting when there was almost none left, so this time I decided to decant. My first time decanting Champagne. BrooklynLady thought this quite strange. "Why would you decant a Champagne," she asked. Same reason you decant any other wine, to expose it to oxygen, and to stimulate the release of interesting aromas. Seems like decanting had an impact - this wine showed incredibly well. The nose is mature and regal, with great depth and class. There are aromas of biscuits, roast nuts, and a honeyed mineral edge. It is a nicely focused nose, really just fantastic, and it invites contemplation. The palate is so elegant and refined, with strong but mellow acidity and a smooth and silky texture. This is not at all a fruit-driven wine, the flavors more about chalk, nuts, biscuits, and wet salty rocks. There is wonderful balance - the wine feels muscular and graceful at once, and it really spreads out in the mouth and tingles the insides of the cheeks. This is fantastic and memorable Champagne and I must taste more from Raymond Boulard. Boulard is one of those growers who ensures that the soil is alive - farming is organic and they are exploring biodynamics. This healthy philosophy is maintained in the cellar, where natural yeasts are used for fermentation, very little new wood is used, and dosage is quite low. Not that there is an absolute quality implied by the level of dosage, but Boulard's wines are balanced with very little dosage, and in the case of this wine, a Brut Nature, no dosage. This wine struck me as a blend containing mostly Chardonnay. In fact, it is 90% Pinot Noir and 10% Chardonnay. So that's how much I know. It just felt like Chardonnay - elegant but powerful, finely focused nuts and steel. No red fruits that I could perceive. Reading more about the wine on the website I learned that up to 15% of this blend is reserve wine, which must account for the mature aromas and flavors. Is that why the wine is not a fruit-driven wine? Is it simply because it is a non-dosed wine? I am guessing that it has more to do with the Mailly Terroir, but that is not something I can speak intelligently about. I'm hoping that Peter Liem reads this and has something to say. I liked this so much that I decided to immediately buy a bottle of Boulard Champagne Petraea, a Solera wine comprised of 75% reserve wines! That fine bottle will be coming soon to Friday Night Bubbles. I don't want to write about wine today, no tasting notes. It's gorgeous outside, things are going well with family, friends, and work, life is good. Instead I'll tell you that I had the chance to hang out with fellow wine bloggers recently. Joe was in from Montreal and he stopped by for a quick glass before his work dinner. He met my 17 month old daughter, who impressed him with her ability to sniff wine in the glass. He brought a lovely gift of a bottle of 2005 Bouzeron crafted by the master M. Aubert de Villaine. We enjoyed the remaining half of a bottle of 2005 Desvignes Morgon Javernières, 2nd Upper Terrace Bottling, on its second day open. I am happy to report to you that Joe liked the wine. We then opened a bottle of 2002 Cazin Cour-Cheverny Cuvée Renaissance. This is a brilliant wine made from the little used Romorantin grape, found essentially only in this tiny little Loire appellation. This wine has many years ahead of it, but I wanted to check in. I also wanted to share it with Joe, as the tyrannical state-run SAQ in Montreal doesn't carry this wine. I am happy to report to you that Joe also liked this wine. And then last night another blogger who lives in tyrannical government controlled wine territory, in this case Pennsylvania, stopped by for dinner. That's right folks, yesterday eve I supped with none other than David McDuff. We enjoyed several bottles and some cookin' with Brooklynguy, but I think I'll save the details for another time, unless McDuff beats me to it. Except to tell you that the bottle of 1996 Champagne the David brought was just superb. 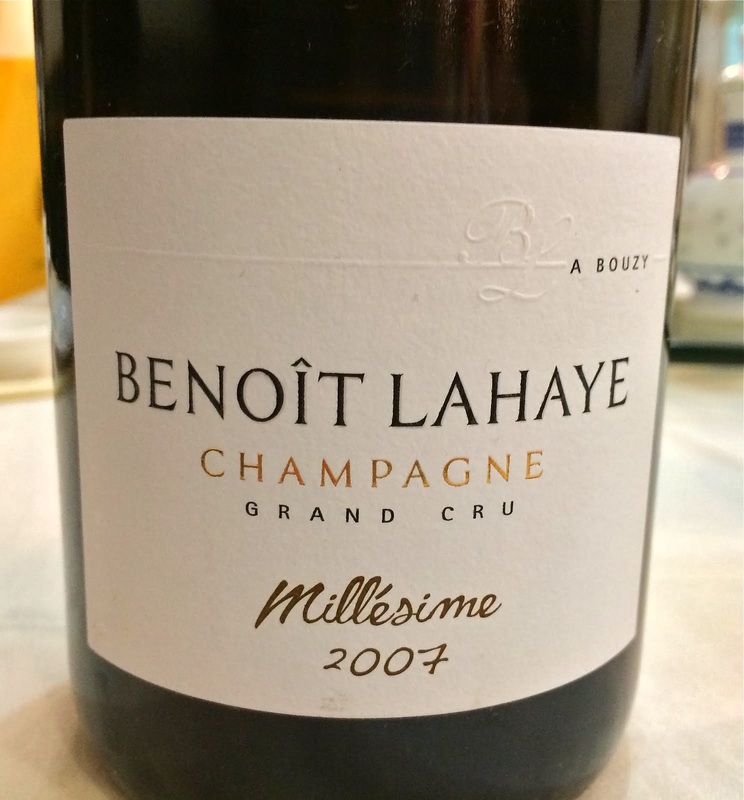 I think I convinced David to write about this wine as a Friday Night Bubbles guest-post. We'll see. Such nice folks, all of you bloggers. Makes me think hard about dropping what is certain to be at least a grand between air fare, hotel, food, and fun to participate in this Wine Bloggers Conference. Anyway, back to regularly scheduled programming soon.